Couch Potato Classic Slot Guide & Review - Casino Answers! Couch Potato is a 3-reel, 1-line classic slot machine developed by Microgaming, featuring a wild symbol and multipliers. 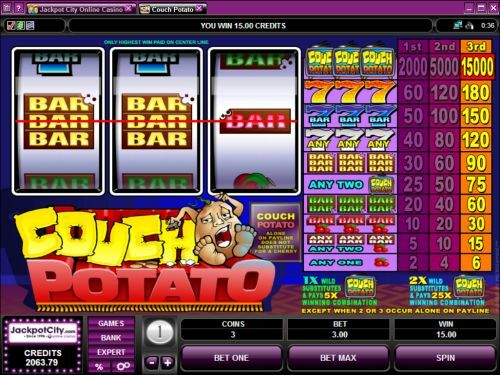 You can play the Couch Potato classic slot machine at Bovada. Bets on the Couch Potato slot game are $0.25, $0.50, $1, $2 and $5. You can bet 1-3 coins per spin on Couch Potato. The lowest total bet you can make is a quarter up to the highest total bet of $15 per spin. To play all three coins on the Couch Potato slot machine, use the “Bet Max” button. For all other bets, select your bet and hit the “Spin” button. The highest paying symbol on the Couch Potato slot machine is the Couch Potato symbol. If you hit 3 of these on the payline on a maximum 3-coin bet, you will win the 15,000 coin top jackpot – an outstanding top payout! The Couch Potato symbol is wild and will substitute for all other symbols in the game. But the best part is that one symbol will multiply your winnings by 5X and two symbols will act as a 25X multiplier! So you don’t need all 3 symbols to win big when you play Couch Potato at Bovada. There are 12 winning combinations on the Couch Potato classic slot machine. The complete payout schedule is as follows (1/2/3 coin payouts in parenthesis): 1 Cherry symbol (2/4/6), 2 Cherry symbols (5/10/15), any 3 Bar symbols (5/10/15), 3 Cherry symbols (10/20/30), 3 Single Bar symbols (10/20/30), 3 Double Bar symbols (20/40/60), 2 Couch Potato symbols (25/50/75), 3 Triple Bar symbols (30/60/90), 3 of any Seven symbols (40/80/120), 3 Blue Seven/Bar symbols (50/100/150), 3 Orange Seven symbols (60/120/180) and 3 Couch Potato symbols (2000/5000/15,000). Hit “Expert” to access Couch Potato’s autoplay mode where you can play 5 or 10 autoplay spins or hit the “Auto Play” button to open up advanced settings. You can set the number of spins (5, 10, 25, 50, 100, 250 and 500), number of seconds between spins (0, 0.25, 0.50, 0.80 and 1.50), stop once all spins are complete, stop when jackpot is won, stop if a win exceeds or equals ($25, $50, $100, $250, $500, $1000 and $2500), stop on any win and stop if credits increase/decrease by ($25, $50, $100, $250, $500, $1000 and $2500). You can stop autoplay at any time. Couch Potato is definitely a recommended classic slot due to its high payouts and extremely high multipliers. So sit back, open a bag of chips, crack open a cold one and play the Couch Potato classic slot when you head on over to Bovada! Can USA players play the Couch Potato slot machine for real money? American players can’t play the Couch Potato slot machine, but they can play a great number of USA-friendly classic slots at Rival casinos such as Bovada. Will the Couch Potato symbol substitute for all winning combinations? Yes, the only exception is it will not substitute for a single Cherry symbol.